Subject description: What exaclty does it do? There is hardly anything written on the dome filter, but if I were to take a guess at what it does, I would say you insert a signal and it shifts it 90 degrees. IMO this would be incredibly useful, so therefore I must be wrong, since Ken's page says it is not a stand-alone project or of use to most people. So, is there any other use for it besides the basis of a frequency shifter? Also, does anyone know of a module that will perform the function I described? Not exactly the same, the dome filter is intended to be an allpass filter which provides with a 90° phase shift over all the frequency range, while the mankato provides a 90° phase shift at the cut-off frequency. To answer the first question, yes the first application is that of frequency shifter. It may also be used as frequency doubler if you feed the two pase shifted outputs to the two inputs of a balanced modulator (MC1496 or other), since the phase shift is constant over a wide bandpass, all the partials are doubled in frequency. Another application is to create a spacialization of a monophonic source : feed two outputs to separate inputs of a stereo mixer and set the pan pots to a different position and the monophonic sound will spread over a solid angle. shouldnt that be called a phase shifter instead of a filter then? It is a phase shifter, but such a device is what is primarily called an all-pass filter. So, say you put in a sawtooth and shift it 90° over the whole frequency range. Does it still look like a sawtooth after? If your dome filter is perfect, yes, I think so. Hmm, well what do you mean by "perfect"? 0.1% resistors and such? I guess the slightest error would produce a nasty glitch in your waveform? I think a couple of things get mixed up here? As I understand things there are constant time delay filters and there are constant phase filters. And these are different things; a constant time delay would result in a linearly changing phase. By perfect, I mean a 90° shift within 0.1% over a 30kHz bandpass (and this is difficult to achieve when you consider the tolerance of components). If not, some partial will not be in phase and this might change the output waveshape (though the harmonic amplitudes are maintained). I think Ken meant that the dome filter on it's own is useless but that one has to experiment by combining it with other circuits to find some interesting applications. In other words this is not a "plug-in" board, it is a more demanding circuit. large number of patents on tube/valve audio/video circuits. I finally got myself to brave stuffing my Dome boards... The formula for the recommended component values is screened onto the top, and I had already read about the circuit in Electronotes #83. Since I had the suggested capacitors I decided to fuss with resistor values, since I have more to choose from. It took me about four hours of going through resistors and measuring to get these close, so hopefully this might save somebody some time. This was the easist to do with what i had on hand. It still took lots of measuring various combinations, sometimes even trying the same value from different manufacturers. Still I was able to get within a few hundreths for each value, many of them spot on. As for what to do with these? I was thinking I might build something like the Electronotes frequency shifter, but unlike most people's leave it more openly modular so the subcircuits can be blocks to be patched. Why not have a high-frequency sine VCO, multipliers, and phase networks to play with? It'll be a while yet though, I am still building my basic setup. So let's say I build 2 of these boards. I use one for the carrier and one for the signal. Then I use a balanced modulator, like the MC1496 and sum/multiply them together. And I got a Frequency shifter? It sounds a little bit to straight forward.. So what's the catch? Can I use anything else instead of the MC1496? I guess a normal ring modulator wouldn't do? The catch is that it's a fairly large, involved project. It probably requires lots of adjustment. As I understand it, first one uses a pair of multipliers in parallel on a fixed 20kHZ oscillator and a quadrature VCO. Then we'd process our signal of choice through a Dome filter. The VCO sine and Dome sine are routed through a multiplier, and their cosines are routed through another multiplier. The multipliers outputs are summed and passed through VCAs which use an envelope extracted from the input signal. You could use MC1496, but a more precision multiplier would probably be far less noisy. It is already a drastic effect, and people say that too little linearity between it's input and output detracts from it's usefulness. If it gets too noisy, the output might not resemble the input any longer! The original called for AD533, but the newer AD633 will probably be fine. Personally I think it might be fun to try non-standard settings. What if the phases aren't 90 degrees? What if the phases are changing? What if the quadrature VCO can do more complex waveshapes than sine? And yes, it is possible to use a second Dome filter instead of a VCO, but the result would be very complex. I don't know if I'd like the sound, but I want to hear these things. I recommend Jurgen Haible's page on frequency shifting, where he explains his circuit. I am a noob and only beginning to understand this. Yes, this is what I'm interested in! I built Haibles FS1A a few months ago and I like it. But I'd like one that could be very experimental as well. Here's my idea. 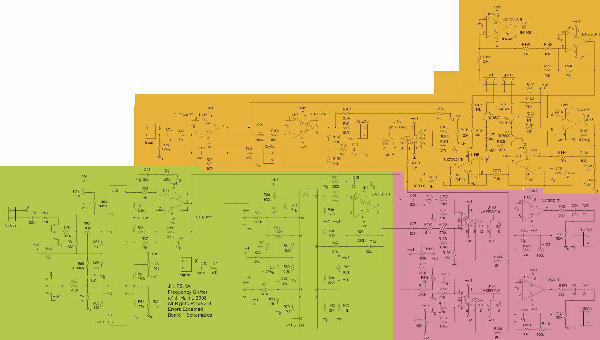 Removing the oscillator from the FS1A and keeping the compander (orange), the modulator (green) and the VCAs (pink). So you feed the input signal to the input and cmp_out to the dome filter. The other you feed straight into the dome filter, then put the signal from the first dome filter into sig_sin and sig_cos. And from the other filter you have the input at R58 and R77..? (I hope it's OK with mr. Haible that I post mutilated pictures of his schematics! If not I'll remove it straight away!). No it won't *look* like sawtooth, if we are talking about the shape of the wave (which will change) and not about it's harmonic content and sound (which will stay the same). ...and this dome filter doesn't do 90deg phase shift to the input anyway. What this dome filter does, is creating two outputs with 90deg phase shift between them. So it is not 90deg phase shift between input and output, it is between output1 and output2. And neither of them will look like saw. But will sound the same. Found my old patch, where I was checking exactly that - how a saw would look after various phase shifts. Thanks for the information, angakok_toth! Just finished my FS project. A 12 stage Dome Filter and two AD 633 as RMO form a part of this FS design. For work you need a quadrature VCO. Doepfer A110-4 or so work perfect. Look at klangbaukoeln for more information.